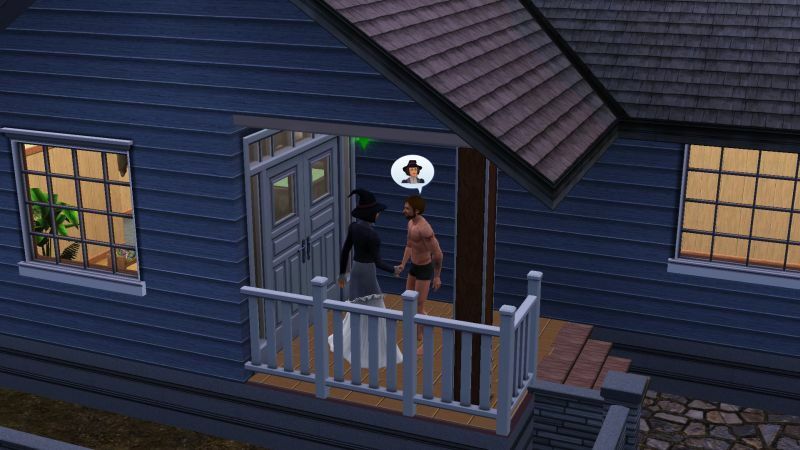 And so it begins the Sims mating ritual, which consists of trying all romance options, making sure new ones are used as soon as they appear until the propose marriage option is available. Unfortunately it was a pretty short session of that since Benjamin had to go to work. That is ok, Samantha had to do some more fishing too. She went to a nearby lake to fish, getting another couple skill levels raising it to a mighty... 4. Baby steps! As soon as Benjamin returned home she immediately dropped everything she was doing to go pay him another visit. Nope, that is not creepy or stalkery at all! Unfortunately Samantha wasn't able to score a Whoohoo too. It makes her wonder about the truth of all those stories about Benjamin being popular with the ladies by helping them fixing their "broken appliances". Maybe it was just something he made up to enrich his own prowess in the bed? Now, confession time. 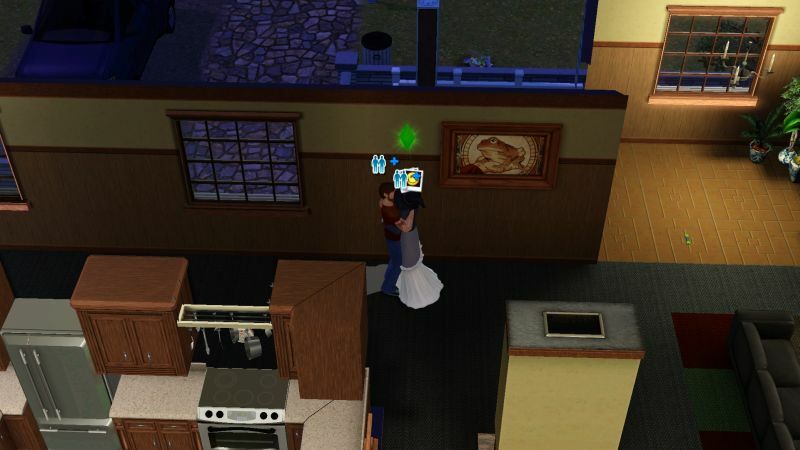 After they woke up prematurely for some reason (I think the dog walked into the bedroom and woke them up, not sure), I did try another round of Sims mating ritual. That didn't work out for a series of a reason, with Benjamin rejecting the marriage proposal and both having a lot of their need bars at pretty low levels. I got so annoyed that I end up quitting without saving. If we are very strict in following the rules of the challenge this should terminate things right there. I decided to let it slide though on the grounds of never doing it again. The only exception will be for a game breaking bug. Which is pretty much what happened once I cooled my head a bit and went back with a new plan. My last save was shortly before they abruptly woke up. Benjamin just got stuck on the on the bed side table, unable to move and with no possibilities of interacting. I tried quitting and reloading but the problem just kept happening. I decided to try to use Edit Town to move the offending bedside table only to be reminded that I had to evict the household first before being able to edit the house! Grumping a bit, I just evicted them and put them back. But now thinking about it, using the resetsim cheat would have be a lot simpler. Something to remember next time a bug like that happens. Bugs out of the way, Samantha went for another attack in seducing Benjamin. 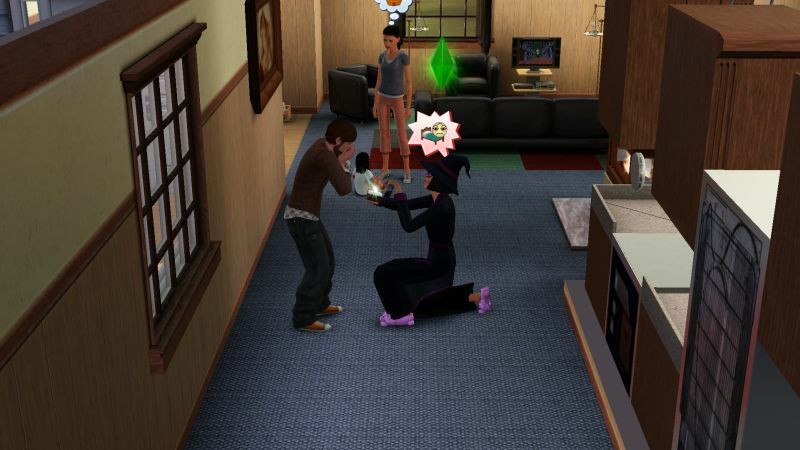 This time with a successful marriage proposal! The two decide to do a private wedding right there. It is not like they have much of a choice anyway, Samantha doesn't have the money for a wedding party. My only worry is that Benjamin is 4 days to becoming an adult. Hopefully that doesn't mean he will die of old age before he can fulfill his duties (i.e. cook the ambrosia). We'll see. For now I send him to a painting class, Samantha to the Fireman Station to fill back her need bars and Ralston is left to her own devices. I will also need to think about my next steps as they may be crucial to ensure there will be an actual dynasty.